(Eventually he asked the poet Charles Anthony Silvestri to write new words for the music that had been set to Frost's poem, you can see the Virtual Choir performance of that composition here and read his full story here; note that Frost’s lawyers were mistaken about when the copyright ends, as indicated above, it lapses in 2019, if it hasn’t already.) Beginning in 2019, the next Whitacre won’t face this frustration, and anyone may use this powerful poem in their own creations. Note that copyright law has a way of introducing complexities into any analysis. There are some familiar works that appear to be from 1923, but are not in fact entering the public domain in 2019 because of publication details. One is Felix Salten’s Bambi, A Life in the Woods, the basis for Disney’s famous movie. Salten first published it in Germany without a copyright notice in 1923, then republished it with a compliant copyright notice in 1926. When Disney (of all companies) claimed that Bambi was in the public domain, a court disagreed, holding that because the initial 1923 publication was in Germany, the failure to include a copyright notice did not put the book into the US public domain. The 1926 publication was valid, so the book’s copyright expires after 95 years in 2022.4 (The court’s full opinion is here.) Also, while the copyrights in several Jelly Roll Morton songs lapse in 2019, his famous “King Porter Stomp” was not copyrighted until 1924 (even though it was recorded in 1923), so it is not entering the public domain until 2020. It's a Wonderful Public Domain. . . . What happens when works enter the public domain? Sometimes, wonderful things. 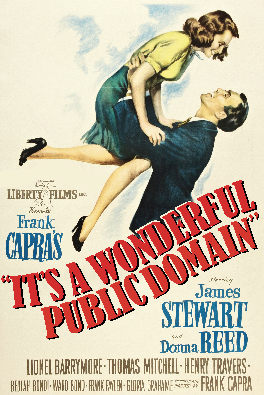 The 1947 film It’s A Wonderful Life entered the public domain in 1975 because its copyright was not properly renewed after the first 28-year term. The film had been a flop on release, but thanks to its public domain status, it became a holiday classic. Why? Because TV networks were free to show it over and over again during the holidays, making the film immensely popular. But then copyright law reentered the picture. . . . In 1993, the film’s original copyright holder, capitalizing on a recent Supreme Court case, reasserted copyright based on its ownership of the film’s musical score and the short story on which the film was based (the film itself is still in the public domain). Ironically, a film that only became a success because of its public domain status was pulled back into copyright. 1 No published works have entered our public domain since 1998. However, a small subset of works—unpublished works that were not registered with the Copyright Office before 1978—have been entering the public domain after a life plus 70 copyright term. But, because these works were never published, potential users are much less likely to encounter them. In addition, it is difficult to determine whether works were “published” for copyright purposes. Therefore, this site focuses on the thousands of published works that are finally entering the public domain. Please note that unpublished works that were properly registered with the Copyright Office in 1923 are also entering the public domain—for those works, copyright was secured on the date of registration. 3 The list of public domain music refers to the “musical composition”—the underlying music and lyrics—not the sound recordings of those compositions. Federal copyright did not used to cover sound recordings from before 1972 (though pre-1972 sound recordings were protected under some states’ laws). However, a new law from 2018 called the Music Modernization Act has federalized copyright for pre-1972 sound recordings, in order to clear up the confusing patchwork of state law protection. For more information about this law, please see the Copyright Office's summary. 4 Foreign works from 1923 are still copyrighted in the US until 2019 if 1) they complied with US notice and renewal formalities, 2) they were published in the US within 30 days of publication abroad, or 3) if neither of these are true, they were still copyrighted in their home country as of 1/1/96. Note that the copyright term for older works is different in other countries: in the EU, works from authors who died in 1948 will go into the public domain in 2019 after a life plus 70 year term, and in Canada, works of authors who died in 1968 will enter the public domain after a life plus 50 year term. Public Domain Day 2019 by Duke Law School's Center for the Study of the Public Domain is licensed under a Creative Commons Attribution-ShareAlike 3.0 Unported License. You can read more about the public domain in Professor James Boyle's book The Public Domain: Enclosing the Commons of the Mind (Yale University Press, 2008) — the full text is available for free here.